(Nanowerk News) A new method allows the quantum state of atomic "qubits"--the basic unit of information in quantum computers--to be measured with twenty times less error than was previously possible, without losing any atoms. Accurately measuring qubit states, which are analogous to the one or zero states of bits in traditional computing, is a vital step in the development of quantum computers. A paper describing the method by researchers at Penn State appears in the journal Nature Physics ("Stern–Gerlach detection of neutral-atom qubits in a state-dependent optical lattice"). The team determined the accuracy of their new method by loading their lattices with atoms in either one or the other qubit states and performing the measurement. 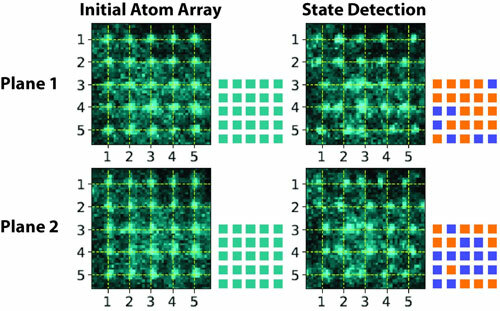 They were able to accurately measure atom states with a fidelity of 0.9994, meaning that there were only six errors in 10,000 measurements, a twenty-fold improvement on previous methods. Additionally, the error rate was not impacted by the number of qubits that the team measured in each experiment and because there was no loss of atoms, the atoms could be reused in a quantum computer to perform the next calculation.